This course does not purport to be an exhaustive analysis of the corporate and tax law considerations relevant to all business decisions. 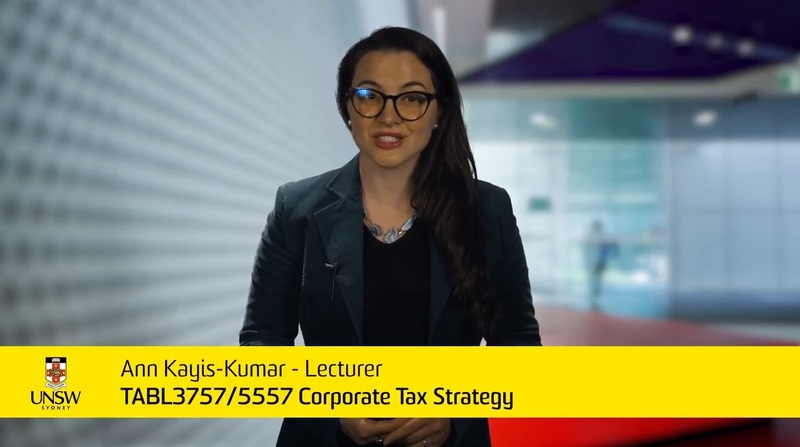 In addition to an analysis of relevant provisions of the Corporations Act 2001, Competition and Consumer Act 2010 and the Income Tax Assessment Act 1936 and the Income Tax Assessment Act 1997 the subject will examine contemporary real life examples of problems and issues that arise in these areas. This course builds on the previous studies of students in Business Entities and in Business Taxation. It is concerned with the relationship between corporate law, taxation law and business decision making. Raise your awareness of ethical issues arising in corporate tax strategy. CLO 1: Identify key issues relevant to corporate tax strategy in a given fact situation. CLO 2: Identify different outcomes that result when different tax planning strategies are used in relation to corporate tax strategy. CLO 3: Explain your response to issues arising in corporate tax strategy through oral and written presentations. CLO 4: Work in a team to identify issues and propose solutions to problems. CLO 5: Evaluation ethical considerations arising when alternative tax planning strategies are used in relation to corporate tax strategy. Specify the course TABL3757 as your lecturer may be teaching more than one course. Raising your awareness of ethical aspects of business decisions. Requiring you to make oral and media assisted presentations of real world case studies in class. The method of teaching in this course will take the form of lectures, discussion of case studies, presentation of real world case studies by students in small groups. The purpose of lectures is to provide you with an outline of the main statutory provisions and case law relevant to the issues discussed in the course. Lectures are not intended to be a substitute for reading and analysing primary source material and opinions of commentators in textbooks and journal articles. To prepare for lectures you should read the references for the week in question in the course Reading Guide before attending the relevant lecture. The purpose of in class discussion of case studies is to illustrate the application of principles in hypothetical fact situations. It is important that you prepare for case study discussions by reading the references for the week in question in the Reading Guide and by thinking about the possible issues in the case study before attending the relevant class in which the case study is discussed. You will be required to research, write up and present in class a Real World Case Study. Details of the requirements for the Real World Case Study are set out later in this Course Outline. This activity has several purposes. These include: (a) building your awareness of the application of the principles discussed in the course in real world situations; (b) developing your written and oral presentation skills; (c) enhancing your skills in researching current issues in business practice; (d) raising your awareness of ethical issues associated with corporate tax planning strategies. To assist in achieving Course Aims 1, 2, 3, 4, 5, 6, 7 and 8 you are required to in teams of 8 write up a Case Study of a recent event (such as a takeover, a buy back, a demutualisation) that has actually happened that is relevant to taxation or corporate law aspects of the three major topics dealt with in this course. The Case Studies can either be based on events that are a matter of public record or can be based on matters that you have encountered in your working life that are not matters of public record. Students will have an opportunity to plan their Case Study during the lecture on TBA. The account of the Case Study should be not less than TBA words in length. Students will also be required to present their Real World Case Study in class. Students should circulate a synopsis of their presentation of their Real World Case Study when making the presentation. Presentations should not exceed 5 to 10 minutes in length and should be in the form of an executive summary that highlights the key points from the Case Study. The due date for submission and presentation of Real World Case Studies is TBA. The Final Examination will be a take home examination posted on Moodle on a date during the Final Examination period to be agreed with students. Normally the Final Exam will be posted on Moodle by 9am on a Friday morning and students will be expected to submit their responses via Turnitin by 5pm on the next Monday. There will be two problem type questions in the Final Examination. Marks will be awarded for technical accuracy, and clarity of analysis and expression. Chapters 18 to 20 and 22 of Woellner, Barkoczy, Murphy and Evans, Australian Taxation Law, 28th edition, OUP, 2018. Hanrahan, Ramsay and Stapleton, Commercial Applications of Company Law , OUP, latest edition. Legislation and case law is constantly developing in this area. Updated references will be placed on Moodle throughout the course. The following texts discuss in some depth many of the topics dealt with in this course. Unfortunately, some of the texts are now several years old and only contain references to ITAA97. Students need not read these references prior to classes on the topic but should find reference to these texts to be useful follow-up reading to classes. Students should exercise care in using older texts as both the legislation and case law may have changed since the text was written. Reference should always be made to the latest version of the relevant Statute and to current commentaries to check the current position. Additional references and suggested readings may be placed on Moodle throughout the course. Baxt, Black and Hanrahan, Securities and Financial Services Law, Lexis Nexis, 8th edition, 2014. Throughout the course materials will progressively be placed on Moodle. These materials will include case studies and notes on various topics dealt with in the course, additional references relevant to topics dealt with in the course and references to recent statutory and case law developments relevant to the course. Students should check Moodle regularly throughout the course. The course content was detailed with long readings which were hard to cover in a 12 week semester. The Simulation Games no longer form part of the assessment workload. Rather, they will be used as in-class case studies. A more detailed rubric has been developed in relation to the Real World Case Study. This rubric has been placed on the course Website. Providing examples of Real World Case Studies from previous years on the course Website. The course content has been reviewed with the result that some topics will be taught in less detail in 2018, with more emphasis on practical applications of theoretical content.